Strike Vector EX is a competitive first-person aerial-combat game that satisfies every gamer’s fantasy of waging dizzying dogfights with super-powered aircraft. 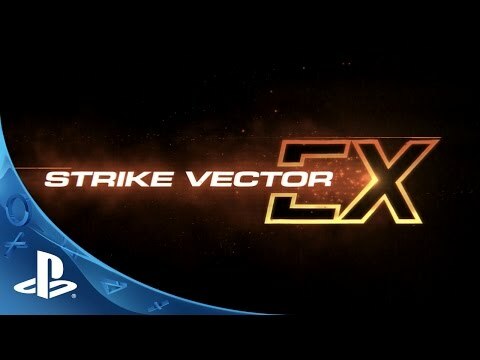 Bursting with customizable mech-inspired ships, Strike Vector EX disrupts the air combat genre through a combination of impressive mechanics, imaginative aircraft, and stunning, first-person, fast-paced multiplayer fights. Strike Vector EX is designed with new console-based controls and upgraded with new features and modes for PlayStation®4. To complement the already robust competitive multiplayer game, Ragequit brings a story-based single-player campaign complete with characters, cutscenes and deadly AI, new training modes, and a huge variety of battle styles ranging from elimination and survival to duels, boss fights, and demolition. Robust Multiplayer: Up to 16 players will vie in the ultimate fast-paced mech dogfight Console Controls: Extensively tested new console-based control layout is designed for Xbox One andPlayStation 4 New Story Mode: Players will experience a unique story spread across 15 missions, packed withsurvival, attack, destroy, duel and other diverse gameplay styles against relentless AI. Next Gen Graphics – Take your aerial dog fighting skills to the next generation of consoles featuringgorgeous and diverse floating warscapes and wild mech-inspired aircrafts. Customization – Enter the garage and load out your ship with up to 10,000 different weapon, specialitems, and armor combinations to find the perfect killing machine for you.  Tactical Gameplay – Perfect the art of high-speed attacks and mid-air VTOL tactics using theenvironment to skillfully defeat your foes. Generous Game Modes – Tired of smacking the competition around? Explore a vast set gameplaymodes including Elimination, Defense, Survival, Dual and many more ways to satisfy your competitivespirit. Maps – Never grow tired of destroying your best friends in mid-air with dozens of diverse andchallenging multiplayer maps.